This weekend sees the city of Chicago with 3 vertical wind tunnels as opposed to the usual 2. The existing tunnels are permanent installations located in Naperville and Rosemont. The 3rd location is a mobile installation located inside the event grounds for the 2015 NFL Draft. The NFL Draft is taking place this weekend and as a part of the event, wind tunnel manufacturer Aerodium Technologies has set up a vertical wind tunnel which is open to all visitors. We had a chance to go fly and catch up with Roberto Benitez and his crew the day before the event officially opens. 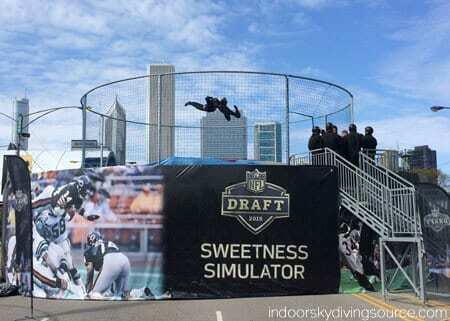 The attraction is called the "Sweetness Simulator" and it lets NFL fans fly against the backdrop of the Chicago skyline. The NFL Draft event is being held in the central portion of Grant Park in downtown Chicago. In addition to all the flying fans, there will be demonstrations flown every hour. Aerodium is unique as a tunnel manufacturer. They install and operate both portable and fixed wind tunnels. Their tunnels range from no-walls with padding surrounding outdoor models to walled open flow designs, all the way to wall-to-wall recirculating installations. The NFL Draft takes place beginning today and runs through Saturday May 2nd. The Aerodium Sweetness Simulator is a free attraction for all NFL Draft visitors. If you're attending the event, be sure to stop by and check out the tunnel!